Flowering canola will keep flowering to compensate (to some extent) for flowers and branches lost to hail. Hailed plants that were past flowering can start to regrow, going through flowering stages again. With enough time, new branches can produce enough yield to make harvesting worthwhile. Time and moisture are the best treatments for hailed crop. If the crop still has decent yield damage, a fungicide application to reduce sclerotinia stem rot due to extended flowering and to stop alternaria, which will enter wounded tissue, may provide an economic return. 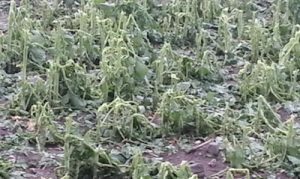 If applying any treatment on hail-damaged crops, keep in mind that there is very little research available on the efficacy of any product for this purpose. Leave appropriate check strips in order to make an accurate yield comparison at harvest. Note pre-harvest intervals if applying a fungicide. Not sure how to design a quick on-farm trial for statistically significant results? Check out the Ultimate Canola Challege website for help. Here’s the UCC protocol for foliar applications.